« The proposed cull of up to 300 Golden Eagles in Norway. National Trust give notice to rescind grouse shooting lease after gamekeeper deployed decoy Hen Harrier in Peak District. In February this year, a man armed with a shotgun, was captured on video by birdwatchers in the Derbyshire Peak District on moorland owned by the National Trust lying full length amongst the heather 30 metres from what appeared to be a decoy hen harrier attached to a short stick. Decoy birds such as a stuffed eagle owl have been used used by gamekeepers and conservationists to trap a variety of birds of prey to either kill them, or for scientific purposes such as ringing. Because the individual observed on National Trust Property in February was armed with a shotgun and not a ringing license, we believe it would be safe to assume this individual was intending to shoot any passing hen harrier he saw. We are please that after the information regarding this incident and video capture was brought to the attention of the National Trust, followed up by pressure from the RSPB, the Trust management have said it had taken the decision to exercise a break clause in the shooting lease to end the relationship four years early in 2018. We have attached below the Press Statement issued by the National Trust. The National Trust has today given notice that the current shooting leases at Hope Woodlands and Park Hall in Derbyshire will end in April 2018. The charity said it had taken the decision to exercise a break clause in the lease to end the relationship four years early. Andy Beer, National Trust’s Director for the Midlands, said: “We have a clear vision for land management and wildlife restoration on the High Peak Moors, which was developed in full consultation with our tenants and other key stakeholders. All our tenants have signed up to deliver to the vision and understand their responsibilities. We work very closely with our tenants and support, consult and discuss any issues relating to the plan on a regular basis. However, in this case we have decided, after a meeting with the tenant, that we should revoke the lease four years early as it became clear that we could no longer have confidence that they were committed to the delivery of our vision for the land. We have given the tenant 22 months’ notice and will start the process of looking for a replacement in 2017, when we will be happy to receive applications from partners who can demonstrate how moorland management and shooting can deliver great nature conservation in a way that is compatible with public access. Like their farming policies which cause mainly ‘sheep wreck’ Raptor Politics don’t think much will come from this. A new tenant will be in the same situation. 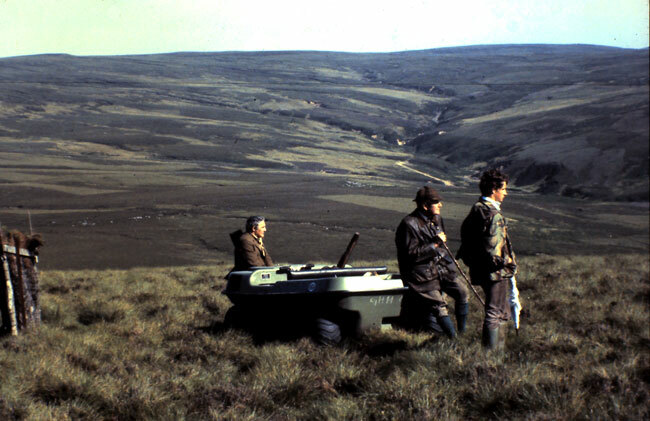 ‘I can’t run a Red Grouse moor with all these raptors. Even more I can’t drive ‘my grouse’ to the butts. I need a reduction in rent if I have to put up with these raptors’. Now if they said they were offering a ‘walked up’ shot then you could see a difference. Certain staff from the RSPB should be praised for putting pressure on the National Trust resulting in this change to happen, but it is about time they came ‘off the fence’ and put their heads over the wall so the public can see them in their true light and stop their members from leaving the society in droves. 6 comments to National Trust give notice to rescind grouse shooting lease after gamekeeper deployed decoy Hen Harrier in Peak District. Several points need addressing. Keepers work for their lord and master hence why this BOP removal takes place. One estate had a ‘1 day notice’ for a keeper if he stepped out of line. If the estate said don’t kill the BOP they would not have a chance in a court for unfair dismissal. Heather can be more destructive than ground predators. During the 2nd World war Golden Plover were lost on Geltsdale due to heather being too tall for Golden Plover to breed. As far as a new tenant the RSPB should take up the NT lease and use it to show how management should be done like here at Geltsdale. And then you might see Black Grouse on what was a moor managed for only Red Grouse which is the majority in Britain. It would be better if the NT teamed up with the RSPB like they have on the Eastern Moors partnership and stopped the grouse shooting on NT land for good! Glad to hear of this! Can the RSPB put the same pressure on United Utilities estates management to stop game keepers continued annihilation of Bowlands birds of prey, and demand that game keepers be removed from Bowland? No evidence is surely needed other than the blatant fact of at least thirty pairs of birds of prey going missing since game keepers came onto the U.U estates? Or can public pressure achieve this? On that note it’s a shame the Protest day is on the 7th of August, it’d be much better on the 12th of August, road block protests etc… that would speak louder. Editor’s Comment. Adam, we could not agree more, yes many people would welcome the Hen Harrier Day on the 12 August. The problem being if any group disrupt an ongoing shoot they would be taken to court and sued for huge damages, it’s not worth the risks. These people are very powerful with loads of spare cash which they would not think twice about spending in court. Is that definitely the case about being taken to court for disrupting a shoot? Hunt saboteurs don’t get taken to court from disrupting Fox hunts? I know that as I have sabbed at least three different hunts numerous times and have never been prosecuted. Thanks for the clarification. I think that the 12th of August would still be the best date to have a peaceful Hen Harrier protest day on as it would be the most noticeable on that date to the shooting community. I expect it would draw attention to the persecution of birds of prey to the members of the shooting community who are oblivious to what really goes on on the moors when they aren’t there! 1. Was the individual using the decoy a Gamekeeper? Or was he just some nutter with a gun? Either way the NT deserves praise for their actions. 2. Yes. The RSPB could well take over this land with the aim of restoring its Raptor Population. This need not necessarily lead to a shooting ban. 3. I totally agree with Adam and have advocated 12th August since the start. Indeed I would hold protests when and where it hurts the shooting most. I do not agree that protesters are vulnerable to prosecution. No crime has been committed and the right to demonstrate peacefully is enshrined in UK Law. Where would the Ramblers be without that Peak Protest? Where would ‘Unions’ be without the right to protest peacefully? The rallies in Trafalgar Square? I am not advocating unlawful actions such as happened in the “Sabs” movement much of which did their cause much harm. BUT there is nothing that can prevent anyone from lawfully exercising their right to use on any day they choose. As to being taken to court for ‘damages’ the onus is on the Landowner to prove his loss to the Bench. That would be extremely difficult indeed. And the publicity would be very useful in swinging public opinion to what has been going on.